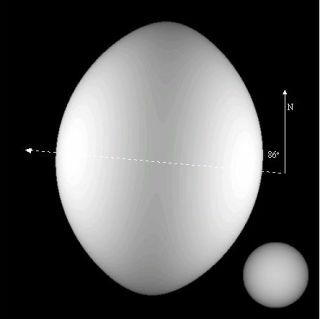 This computer model shows Regulus (left) and the Sun as they would appear side by side. Here, Regulus is tilted so that its axis, denoted by the dotted line, is near horizontal. Shining brightly in the constellation Leo is a fast-spinning star that shoots through the cosmos like an extra-wide bullet, perplexing astronomers as it moves through space in the same direction as its polar axis. Researchers have long known that Regulus, the brightest star in Leo, spins much faster than the Sun, but new observations with an array of telescopes pinned down the star's odd motion and a host of other characteristics. "We don't have any idea why it's really doing that," said Georgia State University astronomer Hal McAlister, who led the study of the star at the university's Center for High Angular Resolution (CHARA). "The picture makes me wonder what it would be like to be in a solar system with this type of star." Regulus' axis is tilted about 86 degrees, presenting astronomers on Earth with an askew view of the star. Using the CHARA array of telescopes atop California's Mount Willson, McAlister and his team were able to make the first observations of how Regulus is shaped by its high-speed rotation: 700,000 miles (1.1 million kilometers) an hour spin at its equator. With such a high rate of rotation -- the Sun, for comparison, has an equatorial spin of about 4,500 miles (7,242 kilometers) an hour -- Regulus bulges out at the center to a diameter about 4.2 times that of Earth's home star. If Regulus spun just 10 percent faster it would rip itself apart, but that's not likely, researchers said. "There's nothing that we know of that can speed this star up," McAlister told SPACE.com. Although Regulus shines about 350 times brighter than the Sun, it burns hotter at its poles (15,100 degrees Celsius) than at the equator (10,000 degrees Celsius), where the pull of gravity is diminished by the star's distorted shape which in turn lowers the temperature, researchers said, adding that the poles shine five times brighter than the equator. Researchers used measurements of the CHARA array's six telescopes to determine Regulus' temperature, speed spin axis orientation along with a light-combining method called interferometry. McAlister said that the Regulus study is just the start of observations with the CHARA array. "Literally we have thousands of other targets to choose from for future study," he said, adding after studying the young, hot Regulus, he'd like to measure the diameters of cooler, older stars. "We're only beginning to dip our toes in this ocean."